The Omega J8006 is Omega's premium horizontal masticating juicer. 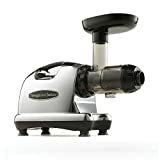 While it is cheaper than the Omega VRT350HD by around $100 (depending on where you shop), it has some pros and cons compared to the VRT350 and other masticating juicers. First of all, the Omega J8006 is horizontal rather than vertical - meaning it will take up more space in your kitchen. Avid juicers recommend having a "juicing station" where you leave out all your juicing tools, such as a chopping board and your juicers. However, if you want your juicer to occupy just a tiny place on your countertop then you will prefer vertical juicers with a smaller base like the Omega VRT 350. Design issues aside, the j8006 is a great juicer. 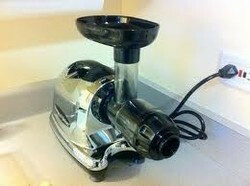 It's a masticating juicer and uses Omega's special low speed juicing technology of 80 RPM. This low speed ensures that the juicer and the juice stay cool, enzymes stay intact and the juice is not oxidized. One of my friends who also uses this juicer mentioned that it took apple juice a lot longer to start to go brown. The J8006, like the VRT350, produces very little foam. The colors and taste of the juice are very strong. Like the VRT350, the J8006 uses a GM Ultem auger which is much stronger and more durable than other augers commonly used in masticating juicers. Infact, it is 8 times stronger than the augers used in the J8003 and J8005 models. Speaking of things under the hood, the J8006 comes with a 2HP equivalent induction motor and has separate screens for juicing hard and soft item. The parts are small and removable, which makes them easy to clean. Clean up is easy, but I highly recommend that you disassemble and rinse right after juicing - this prevents staining from colored fruits and vegetables like carrots, and makes it easier to just rinse off and clean everything. One negative of the J8006 is the relatively narrow 1.5 inch opening. The size of this opening means you will have to chop up fruits and vegetables into smaller pieces. It's a good idea to simultaneously prep and juice. Despite the need to prep items, the J8006 is arguably the best juicer for juicing greens, especially wheatgrass. In addition the J8006 can be used for additional food processing tasks. For instance it can make nut butters from nuts and is very versatile. The Omega J8004 is the same as the Omega J8006, but comes in an all white design, unlike the J8006 which is black and chrome. The J8005 and J8003 are similar to the J8006 and J8004, but they do not have a GM Ultem auger and come with a 10 year warranty instead of a 15year warranty. I love to use a one touch milk frother to easily make delicious coffee, chai or gourmet hot chocolate. The One Touch hands-free can opener has been featured on shopping shows, TV ads, and magazines. If you wonder if it really works, learn about my experience.